What do you get when you cross a hot glue gun with a pair of socks? Some scraps of fabric with shower curtain rings? A jar with some freshly ground flour? The sky’s the limit, right? Homemade gifts are loads of fun to make, give, and receive. I have some fun ideas I’m working on, and I’m hoping you have some even better ideas. But you know how I am with crafts, right? I beg of you – help a girl out? During the next two weeks, I’d love to share many ideas so that we can all put together some simple and inexpensive gifts. Whatcha got for me? I’d love to feature your ideas here! 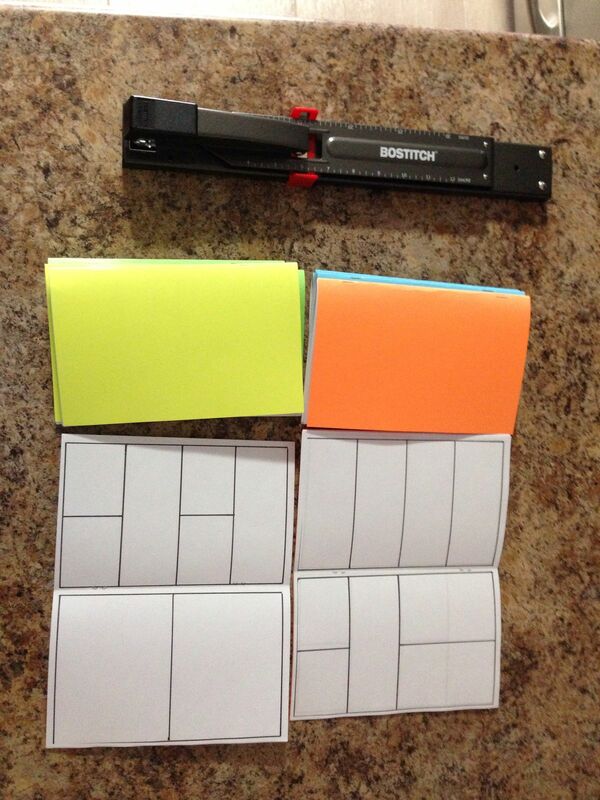 If you have an idea, take a picture, write detailed (but simple – bless you) instructions, and email them to me. My younger boys and I have a sack full of project ideas we’ll be working on this week. If any of them actually turn out – and they totally should because I did invest $2.97 in a new glue gun today – I’ll be sharing my ideas with you soon. 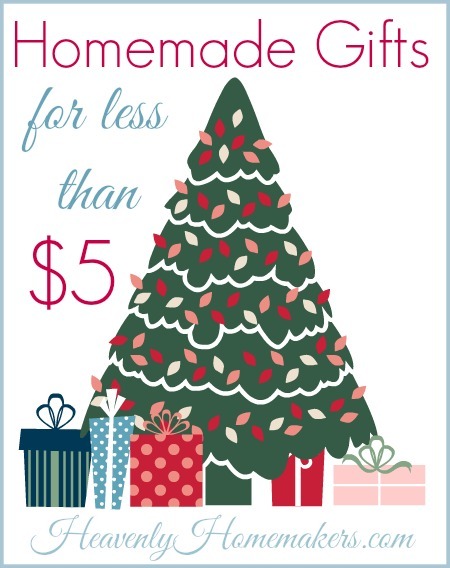 Stay tuned during the next few weeks for these Homemade Gifts for Less Than $5 tutorials, plus plenty of yummy new recipes for the holiday season. Ahhhhh, recipes. That I can do. Don’t worry. I’ll keep my new glue gun out of the kitchen…. My youngest gave them as teacher gifts for her co-op, music, and cottage school teachers! Last year I made felt coasters for family members. I used several large stamps (leaves, flowers, snowflakes) and stamped the images on to 4″ squares of colored felt. Then I used embroidery floss and metallic thread to stitch along the stamped lines of the leaf, tying off in the back. I cut 4″ black felt squares for the backing. The fronts and backs were stitched together with a blanket stich around the edges, tucking the tails inside when finished. Most were assembled when riding in the car as a passenger to and from church and other activities or while watching TV. It was super easy and cheap. I had all supplies on hand, even scraps of felt. I am by no means skilled at embroidery. I do know how to sew and mend clothes. The blanket stitch is the only proper stitch I used. The rest was just me trying to accent the stamped images with color and sparkle. They came out great and I still see them in use at the homes of those I presented them to. FYI – Let the ink on the stamped images dry for a day or two. If you try to handle them too soon they will smear. You could also do this with applique and adhesive/fabric glue. Iron-on designs will not adhere to synthetic felt. I am thinking of printing love ones name and spiritual meaning in a fancy font and frame it. I don’t have pictures ( my printer is down at the moment!) A persons name is one of the most important words to that person and to know that God knew what we would be named before even our parents make it even more special. You have to do a little research and find out the meaning of names and then think of how it could be used spiritually. I also plan to put a Bible verse or reference with it. I hope this helps. Another Idea… no picture for this either. If you live near a Re-Store or salvage shop you can buy old cabinet doors for $1-2. Scrub clean and paint with craft paint or left-over paint. Decorate with stamps, flowers, buttons, knobs, hooks, or whatever you have. Then put a favorite quote on it. You can use sticker letters, adhere cardstock with the text printed on it, or freehand the words with paint or markers. Small doors with raised or inset panels work great for this. I make seasoning mixes for people. One of them is your onion soup mix. I make taco seasoning and ranch seasoning. I save my peanut butter jars to put them in. People love the homemade taco seasoning best. I plan to mail some of these this year but will send them in Ziploc bags so I don’t get hit with heavy shipping. I know a lot of people who just don’t need any more “stuff” in their house so consumables are practical. Everyone has to eat. You and I are so much alike when it comes to crafting, Laura. They must be easy and frugal. I’m looking forward to seeing what everyone comes up with. What a great idea! I’m having my 7yo make bookmarks for all of the readers in our families. She wants to learn to sew, so she picks out scraps of material and cuts them to the desired size. Then inside out she sews them together-leaving an opening so that we can turn it right side out and iron it flat. When we close it up, I take some yarn pieces and sew them in to make a dangle off the top. Then she uses fabric markers to decorate how she wants. The whole thing takes 10 minutes or less. This all started because she wants to make a pillow for her doll-this is practice! I don’t have pictures right now, but she’ll be making some more this week-if you want them let me know. Yes, if it’s not too much trouble to take and send pictures for this project, I’d love it! Duct tape wallets (my 11 y.o. Made them for his brothers and they are still using them a year later). Bookmarks- print out a graphic with their favorite character in approx bookmark size- eyeball it, doesn’t have to be exact. Laminate. Rather than a tassel we attached a loop of elastic that they can wrap around their book. It holds the book closed so the bookmark doesn’t fall out.